As part of a series of memory reviews, the next kit to enter our test beds is a limited edition enthusiast kit from GeIL. Attached with what is called a ‘Frost White’ colored heatsink, this is a two module dual channel kit with a total of 16 GB running at DDR3-2400 MHz at 11-12-12-30 sub-timings that retails for ~$150. GeIL is short for Golden Emperor International Limited, and in the world of memory, have been a main player in the consumer memory space since the late 1990s. Today their product range consists of product names typically reserved for cars – Corsa, Leggera, and in this case Evo Veloce. This could imply that GeIL want to advertise themselves at the forefront of memory production, and this is shown by their catalogue on Newegg showcasing mostly kits with 8GB modules. The bulk of their memory sales comes from their Corsa range, featuring yellow colored heatsinks in a range of capacities (8GB modules to 8x8GB kits) and speeds (1333 to 2133 MHz). The Leggera range has similar speeds (up to 2400 MHz) and capacities (up to 4x8GB kits), but smaller blue heatsinks. Today we are looking at one of GeIL’s Evo Veloce kits, kitted out in a ‘limited edition’ frost white. The heatsinks are large, and with two 8 GB modules, there leaves room for upgrades in the future. 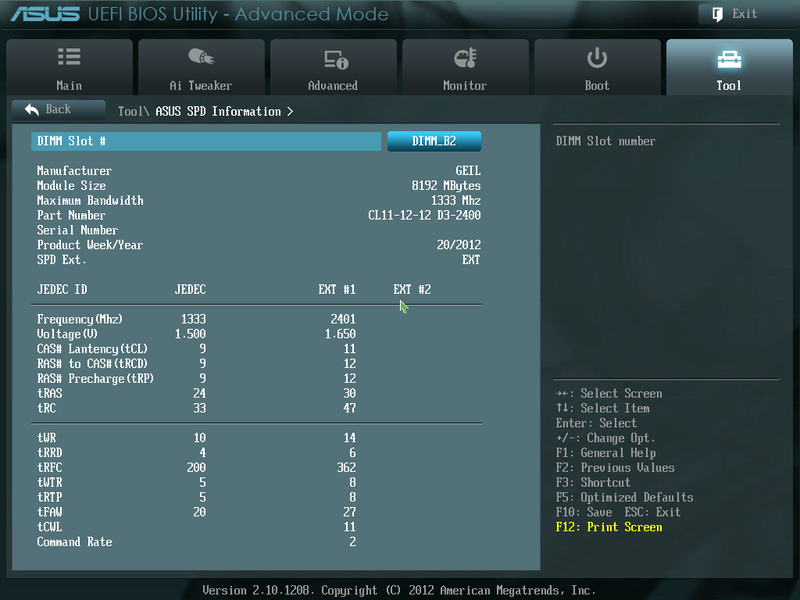 Back in the 'DDR3 on Ivy Bridge' overview, superlatives were not forthcoming with our DDR3-2400 C10 kit under scrutiny. It offered little performance gain over the DDR3-2133 C9 kit, but asked for another $15 for the privelege to exceed in peak synthetic results only. The GeIL Evo Veloce DDR3-2400 11-12-12 2x8GB kit then has a tough act to follow, coming in at $150 (more than the 2400 C10 kit) and having the timings reduced. The upshot of all this is more capacity per module, leaving the door open for future upgrades, or maximising the memory in a dual module system. When making the jump from 4GB modules to 8GB modules, compromises have to be made. It could be construed that as everything is smaller, accesses should be quicker – but with double the density we can accrue additional latencies by reading larger rows in our memory module. Whether that actually makes a difference in normal day to day tasks is another matter – everything to do with memory and memory speed borders on the debatable when it comes to actually affecting everyday use. Whenever we look for a memory kit, having something extra to talk about always helps – aesthetics or overclocking usually works well. 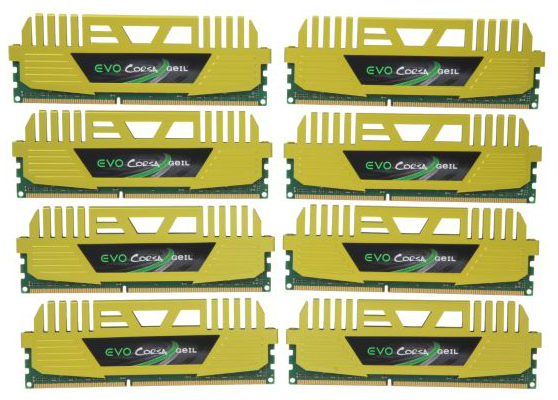 While the Evo Veloce frost white modules look nice, they overclocked relatively well, hitting 1T with no issues, as well as overclocking to DDR3-2600 11-12-12 and DDR3-2400 10-11-11 at stock voltages. While the module is in the slot, we are right up against the cooler and there is some pressure there against the module forcing it at an angle. Users with these modules may want to invest in some form of all-in-one liquid cooling as a result. In our actual testing we use an ASUS P8Z77-V Premium and a stock Intel cooler, meaning spacing is not an issue. I think it already is no meaningful difference in most games, even with the integrated GPU! As with all memory performance tests, the real world difference is so small that it makes no sense to throw money at higher speced memory. Almost in all circuimstances, perhaps except some special cases like they highlighted in an earlier article hear at anand. The biggest difference there was for Winrar64 compression (not the usual unpacking we normal user do almost daily) and that was still only 20% differece between 1333 and 2400. If you're going to spend money on higher end memory then you may as well fork over a little for a discreet graphics card instead. It will make much more difference in games. Intel integrated graphics are only good for office usage still. No real gamer or anyone doing heavy GPU calculations, cares about Intel IGPs. That's the thing - not everyone that has a PC uses it for gaming. As alluded to by Magnus, there are other things that do not need a discrete GPU but are still used by a large number of enthusiasts - VMs, compilations, even non-parallel scientific simulations. You whack in a stupidly large matrix into memory and it will bog down. Failing that, how about financial calculations? Now put all that inside a mITX chassis and board where you're limited to two memory slots. Sure 2x8GB 2400 C11 may not be your first port of call, but if saving an extra 3-5% time on whatever you do actually has a financial impact on your work portfolio, then the early investment could pay off in the long run. Then again, it may not and that 2x4GB 1333 C9 is looking a little sweeter. No article is bogus, as you put it. Sure there are good things to review and some that are not so good. If we solely focused on the good, then we'd all be sitting around patting each other on the back for doing a service to the industry. I like reviewing all sorts - you get to see the niggles of the smaller companies that can't invest, or you can point out when a top company is just being stupid. Thus when you get a really good product that shines out from the rest, it is something special to behold. Anyone who has actually tested higher RAM frequencies or RAM quantities above 4 GB. in a typical modern desktop PC knows that frequencies above 1600 MHz. produce no tangible system performance gain in either Intel or AMD powered PCs. Tangible means a change in system performance that you can actually see and or feel. In addition more than 4 GB. of RAM produces minimal gains unless you operate your PC with many applications open or functioning concurrently, which most people don't. CAD, modeling, and some other business applications CAN benefit from more RAM but many consumer apps don't. Be advised that RAM benches grosssly mis-represent the actual SYSTEM gains because they assume the RAM is saturated 100% of the time, which it is not. If you run real applications and compare 1333 MHz. to 2400 MHz. you will likely not even be able to tell the difference between the two because DDR3 RAM @ 1333+ MHZ. is not a system bottleneck. The RAM mfgs. are doing everything they can to convince enthusiasts to buy high priced high frequency RAM because this is very profitable for them. When you test with real applications and see how tiny the system gains are, you will wish that you had bought 1600 or 8166 MHz. RAM at a reasonable price and used the cash for a faster CPU or GPU.